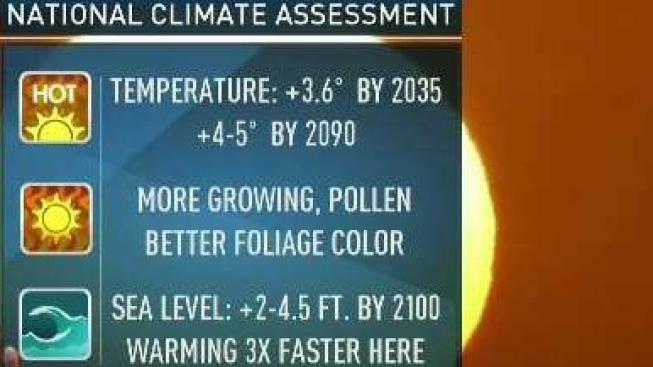 The federal government's National Climate Assessment says that climate change will unleash heat waves that make Chicago feel like Las Vegas, bring disease-carrying mosquitoes to Florida year-round, warm oceans enough to drive lobsters from Maine and more, NBC News reports. This version of the report, released over Thanksgiving weekend, gives many examples of the impact of climate change on the local level both today and what it's projected to do in the future, something critics said the last version lacked. Among the findings for if greenhouse gas emissions continue at the same pace: Chicago could see about as many 100-degree days by the end of the century as Las Vegas did on average between 1981 and 2010. The report projects that wildfires in the Sierra Nevada mountains, where the Camp Fire killed at least 88 people this month, could burn as much as three times the area between 2071 to 2100 compared to 1961 to 1990.